We use Slack intensively within our team to share knowledge. We created a dedicated news channel to post relevant articles, but usually don't have time to read the all the stuff during working hours. It's also not so easy to keep track of all articles you've already read. RSSBot can help. RSSBot organizes all shared links within a channel and generates a RSS feed which can be imported in any RSS reader. Now it's easier to read shared articles from Slack while on the go e.g. in the subway. The bot runs as micro service on AWS Lambda leveraging DynamoDB and SNS to decouple asynchronous tasks (e.g. to fetch additional metadata of the link). To fully automate deployment of the micro service in multiple stages I used CloudFormation and Serverless.com framework. 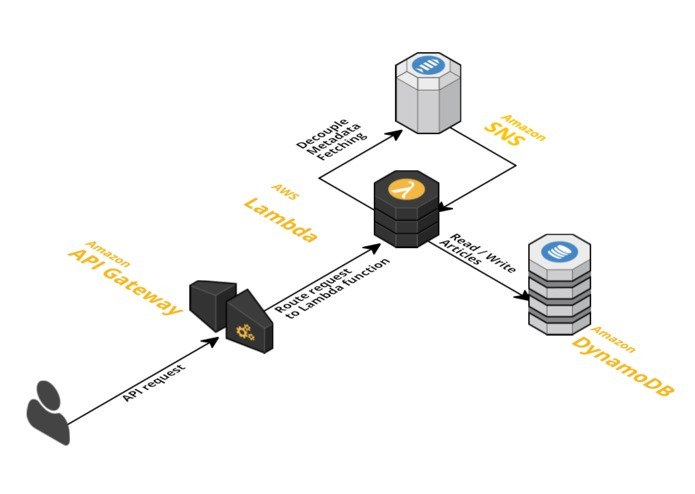 The main challenge was to accomplish an automated deployment of the AWS infrastructure with serverless.com and pass dynamic references to the micro services within a multi-stage environment. I developed the full stack using the serverless.com framework for deployment.